Remanufactured HP MICR Toner Cartridge, Black, High Capacity 12,000 page yield. Replaces HP part number: Q6511X-micr, Q6511A. 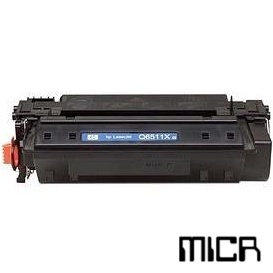 MICR Toner Cartridge compatible with HP LaserJet 2400, 2410, 2420, 2430. Compatible HP Toner Cartridge, Black, High Capacity 12,000 page yield. Replaces HP part number: Q6511X, 11X. Laser Toner Cartridge compatible with HP LaserJet 2400, 2410, 2420, 2430.